Uncertainty over Porter Airlines’ growth path has developed now that the new Canadian government has essentially nixed the airline’s plans to operate Bombardier CSeries narrowbodies from Billy Bishop Toronto City airport. Porter unveiled its ambitions to expand from Billy Bishop, and a conditional aircraft order from Bombardier roughly two years ago. From the onset, Porter faced strong political opposition for its plans to extend the runway and add jet operations from the airport, which is currently limited to turboprop flights. As political backlash against changing the airport’s operating profile continued to grow, Porter offered no real back-up plans for its business going forward if its plans failed to materialise. After the new government’s dismissal of the plan, Porter still has not outlined its business strategy going forward. Its lack of clarity results in questions about the the state of its overall viability in the Canadian market place when its two largest competitors continue their expansion unabated. Both Air Canada and WestJet have an intense focus on properly serving all of Canada’s passenger segments, especially the high yielding traveller that serves as a foundation of Porter’s business model. Amid much fanfare, Porter in 2013 tabled plans to order 12 CSeries jets for operation at its largest, and arguably only, base at Billy Bishop. The plan rested on changing stipulations in an agreement among the city of Toronto, PortsToronto and the federal government governing operations at the airport. The tripartite agreement bans jet operations. Additionally, Porter also needed to gain approval to extend the airport’s runways to support jet operations. Porter’s plans spurred an immediate political firestorm. It drew fierce opposition from local politicians. But despite the controversy a study was conducted to examine the effects of Porter’s proposals. Throughout 2014 Porter expressed confidence of gaining the requisite approvals for its expansion plans; however, a new liberal Canadian government was elected in late 2015. Shortly after Canada’s transport minister declared the agreement covering operations at Billy Bishop would not be re-opened. It was always a huge risk for Porter to peg its expansion strategy on the whims of politicians. In the two years since it outlined the next phase of its business evolution, Porter has publicly expressed confidence that its proposals would ultimately gain approval. Obviously, it is not clear what was occurring behind closed doors at the airline as Porter observed the backlash to its expansion plans for Billy Bishop. In late Jan-2015 Porter sold the only terminal at Billy Bishop, which it owned, to a consortium led by InstarAGF Asset Management. Specific terms of the sale were not disclosed, but the terminal in 2014 was valued at CAD500 million (USD611 million, using the exchange rate at the time). Porter stated it would use proceeds from the sale to invest in its growth. But in 2014 company executives noted it had been nearly 10 years since investors committed to the airline, and it was appropriate they receive some return. Porter cancelled plans for an IPO in 2010. After the government rendered its decision not to alter the agreement covering operations at Billy Bishop in late 2015, Porter told several news outlets it would continue assessing the situation. The statement does not offer a lot of comfort to investors, nor does it engender a lot of confidence in Porter’s ability to craft a growth strategy for the long term. Porter will obviously continue to operate the bulk of its 26 Bombardier Q400 turboprops from Billy Bishop. But the airport is also slot controlled, and even though Porter holds the majority of those slots, its growth at the facility is obviously capped. An inability to operate larger jets also limits Porter’s expansion. 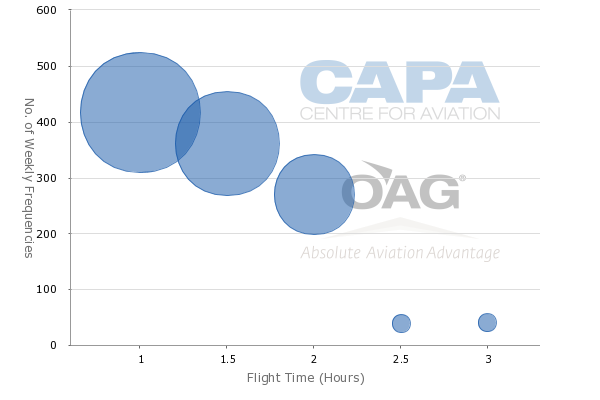 The range of the Q400 is 1,362nm, which results in the bulk of Porter’s flights ranging from one to three hours. 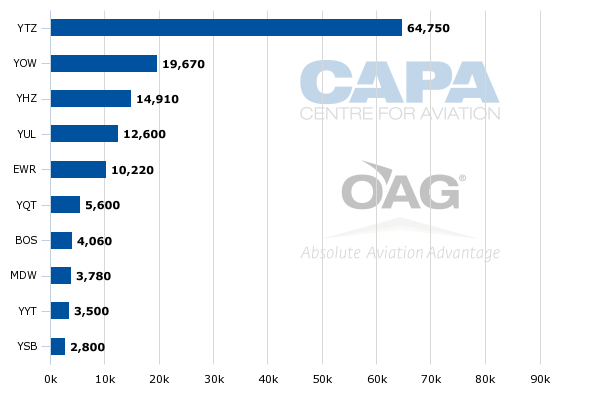 Data from CAPA and OAG show, as of 20-Dec-2015, that Porter operates to 21 destinations – 14 in Canada and seven in the US. All of its Canadian operations are concentrated in eastern Canada and its US destinations are largely centred on the country’s east coast. Its most US western destination is Chicago Midway. The networks of its rivals dwarf Porter, and Air Canada and WestJet both have an ability to market broader global coverage through their partnerships. Porter has interline partnerships with JetBlue, Qatar, El Al, Emirates, Icelandair and Sata. Air Canada has an ability to offer blanket coverage to Europe through its immunised joint venture with its Star Alliance partners Lufthansa and United, plus it offers a solid roster of flights to Asia. WestJet has its own European and Asian codeshare partners. Porter, without a viable expansion strategy that allows it to expand its scope will be relegated to its current position as a small, niche third player in Canadian aviation. It presently represents approximately 5% of Canada’s domestic seats. Previously Porter has declared the possibility exists to develop other core focus cities including Ottawa, Montreal or Halifax. It has also hinted at setting up bases in Western Canada. Now it seems the time is right for Porter to outline how it intends to position itself in the Canadian market during the next five years. Porter’s presence at Billy Bishop remains the foundation of its business strategy. The airport’s appeal for business travellers hoping to avoid a long trip to Pearson in order to catch a flight is not disputable. Perhaps now the question to ask is if Porter, and its slot portfolio at Billy Bishop, is an attractive acquisition target? After Porter initially announced its intention to operate the CSeries, some speculation surfaced that Porter was positioning itself as a takeover target, with WestJet emerging as the most obvious acquirer. Since that time WestJet has expanded the operation of its regional subsidiary Encore westward, opening a base for the airline at Toronto Pearson. It may seem illogical for WestJet to consider a dual operation at Pearson and Billy Bishop, but depending on the acquisition price it might be a shrewd move for WestJet to instantly add to its growing business passenger segment. WestJet already has brand recognition and a largely favourable customer service mentality. Encore flies the same type of aircraft that Porter operates – the Bombardier Q400. WestJet’s aircraft could be an easy substitution. It is not clear if any of Porter’s original investors still have an active state in the company after the terminal sell off. But new investors will be hard pressed to invest in an entity with limited growth potential, and an IPO at this point is unadvisable. Porter deserves credit for developing an attractive niche operation from Billy Bishop. But the decision to peg its future business strategy on such a politically sensitive issue seems short sighted. Now is the time for Porter to offer a viable alternative to its lost ambitions at Billy Bishop before the damage from its growing uncertainty continues to grow.